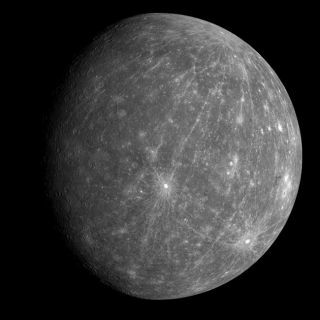 What Does Planet Mercury Look Like? The planet Mercury looks a little bit like Earth's moon. Like our Moon, Mercury’s surface is covered with craters caused by space rock impacts. Mercury is the closest planet to the sun and the eighth largest. It has a diameter of 4,880 kilometers. Mercury has the widest temperature extremes in the solar system ranging from 90 degrees Kelvin to 700 degrees Kelvin. Mercury has a thick iron core and a thinner outer crust of rocky material. The surface of Mercury has enormous escarpments as much as three kilometers high and hundreds of kilometers in length. In addition to its heavily cratered surface Mercury also has regions of relatively smooth plains. Mercury has a thin atmosphere of atoms blasted off its surface by solar radiation. This atmosphere quickly escapes into space and is constantly replaced.